The Milwaukee Brewers visit Busch Stadium on Sunday, October 1, 2017 to play the St. Louis Cardinals. The probable starters are Zach Davies for the Brewers and Carlos Martinez for the Cardinals. The opening line for this matchup has Milwaukee at -127 and St. Louis at +117. The Brewers have a 67-86-7 over/under record and a 84-76-0 run line mark. The Cardinals are 75-85-0 against the run line and have a 80-72-8 over/under record. The Brewers have a 85-75 overall record this season. Starting pitcher Zach Davies has a 17-9 record with an earned run average of 3.90 and a WHIP of 1.35. He has 124 strikeouts over his 191.1 innings pitched and he's given up 204 hits. He allows 9.6 hits per 9 innings and he has a FIP of 4.22. The bullpen has an earned run average of 3.82 and they have given up 505 base hits on the year. Teams are hitting .237 against the bullpen and they've struck out 607 hitters and walked 266 batters. As a team, Milwaukee allows 8.6 hits per nine innings while striking out 8.4 batters per nine innings. They are 9th in the league in team earned run average at 3.99. The Brewers pitchers collectively have given up 1,370 base hits and 634 earned runs. They have allowed 184 home runs this season, ranking them 24th in the league. Milwaukee as a pitching staff has walked 546 batters and struck out 1,328. They have walked 3.4 men per 9 innings while striking out 8.4 per 9. They have a team WHIP of 1.34 and their FIP as a unit is 4.25. As a team Milwaukee is hitting .249, good for 21st in the league. The Brewers hold a .429 team slugging percentage and an on-base percentage of .322, which is good for 17th in baseball. They rank 22nd in MLB with 8.4 hits per game. Orlando Arcia is hitting .273 with an on-base percentage of .322. He has 137 hits this season in 502 at bats with 52 runs batted in. He has a slugging percentage of .404 and an OPS+ of 89. Domingo Santana is hitting .275 this year and he has an on-base percentage of .369. He has totaled 143 hits and he has driven in 83 men in 520 at bats. His OPS+ is 124 while his slugging percentage is at .498. 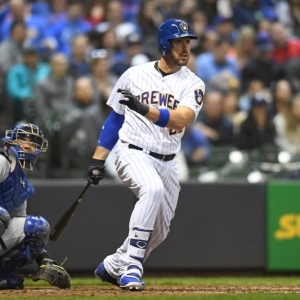 The Brewers have 1,343 hits, including 264 doubles and 221 home runs. Milwaukee has walked 541 times so far this season and they have struck out 1,553 times as a unit. They have left 1,074 men on base and have a team OPS of .751. They score 4.5 runs per contest and have scored a total of 720 runs this year. St. Louis has a 82-78 overall mark this year. With an earned run average of 3.64, Carlos Martinez has a 12-11 record and a 1.22 WHIP. He has 217 strikeouts over the 205 innings he's pitched. He's also given up 179 hits. He allows 7.9 hits per nine innings and his FIP stands at 3.9. The bullpen has an earned run average of 3.84 and they have given up 487 base hits on the year. Teams are hitting .243 against the Cardinals bullpen. Their relievers have struck out 521 batters and walked 181 opposing hitters. As a team, St. Louis allows 8.6 hits per nine innings while striking out 8.4 batters per nine innings. They are 7th in the league in team earned run average at 3.98. The Cardinals pitchers as a team have surrendered 1,373 base knocks and 634 earned runs this season. They have given up 180 home runs this year, which ranks 27th in Major League Baseball. St. Louis as a staff has walked 487 hitters and struck out 1,333 batters. They give up a walk 3.1 times per 9 innings while they strike out 8.4 per 9. Their team WHIP is 1.30 while their FIP as a staff is 4.08. As a team, they are batting .257, good for 15th in the league. The Cardinals hold a .428 team slugging percentage and an on-base percentage of .334, which is good for 7th in baseball. They rank 15th in MLB with 8.7 hits per contest. Tommy Pham comes into this matchup batting .308 with an OBP of .410. He has 136 hits this year along with 73 RBI in 442 AB's. He maintains a slugging percentage of .523 with an OPS+ of 145. Dexter Fowler is hitting .264 this season and he has an OBP of .363. He has collected 111 hits in 420 at bats while driving in 64 runs. He has an OPS+ of 122 and a slugging percentage of .488. The Cardinals as a unit have 1,391 base hits, including 282 doubles and 195 homers. St. Louis has walked 586 times this year and they have struck out on 1,330 occasions. They have had 1,110 men left on base and have an OPS of .762. They have scored 4.71 runs per game and totaled 753 runs this season.